How long is your buffer? Mine is between 55-60 pages, but it took me so long to get that much due to school and work. I planned it out so that it'll last me 'til next January. Hopefully it'll buy me enough time to create another 50-60 pages. I heard that some people make week or month long buffers, so maybe I over did it lol. so maybe I over did it lol. Hmm I usually have about 6 weeks of buffer, but I've been building up in anticipation for the birth of my kid in March, so right now i have about 11 updates and I've went down to a reduced schedule of 3x updates a month, so nearly 4 months of buffer for me at the moment. Hoping I can get the 12th ep of buffer before the kiddo comes. 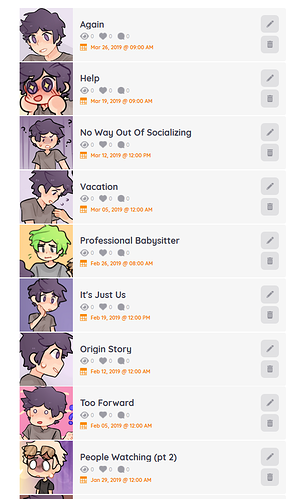 My current work schedule is kinda weird, I upload early on Patreon so I'll always be at least 1 update ahead, I think having the patreon early access is the best thing ever, it gets me to actually finish the episode and upload it without making last minute decisions. The next update after than is coloured but I need to arrange the paneling properly and add text, I have the episode after that lined. right now my buffer iiiiiis....... 14 pages long, 7 updates, just under two months. which is around about the amount of time i need to make the next chapter. i need to be snappy with all that though, bc after that comes my Final Final Final project in college and i think im gonna be decimating my buffer again. I literally have (-)2 pages of buffer. My buffer hasn’t been entirely uploaded yet but, right now I think it’s roughly 33 pages long. I’m working on chapter 4 right now so once I finish the first half of that I’ll have 15 more pages. By the time I get it all fully drawn and colored, it’ll probably leave me with 45 pages because I’ll probably finish up when I have 25 pages left in my current buffer and then just tack on 15 more pages. But yeah I gotta have a big buffer cuz I never know when something will get sprung on me, disrupting my whole work flow. Me too! Seeing everyone else's buffers I admit I'm pretty jealous! I haven't had a buffer in a long time outside of completing a story in one of my novels and dumping a new chapter daily. XDDD Except now where I'm completing my Gingergeist story, but posting batches of at least (3 to 5 chapters) in the style of little episode bombs or whatever they're called to keep interest without blowing everyone's brains out with the immense load of words, action, and spunky sentence structures (Try saying that 3 times fast). Batch #2 will come somewhere after I write at least chapters 6 to 10. I gotta check on the length first. Currently two weeks ahead, but when I finish the batch I'm on, I should be about a month and a half. Here's to hoping it'll last haha. I update one page a week, but my goal is twice a week.Gotta build that buffer. Go Go Go. Currently I have a buffer of about 41.5 thousand words, which comes out to somewhere around 70 single-spaced pages. This means I'm 25 updates (a little over 12 weeks) ahead, and also have a good bit of bonus content already written. 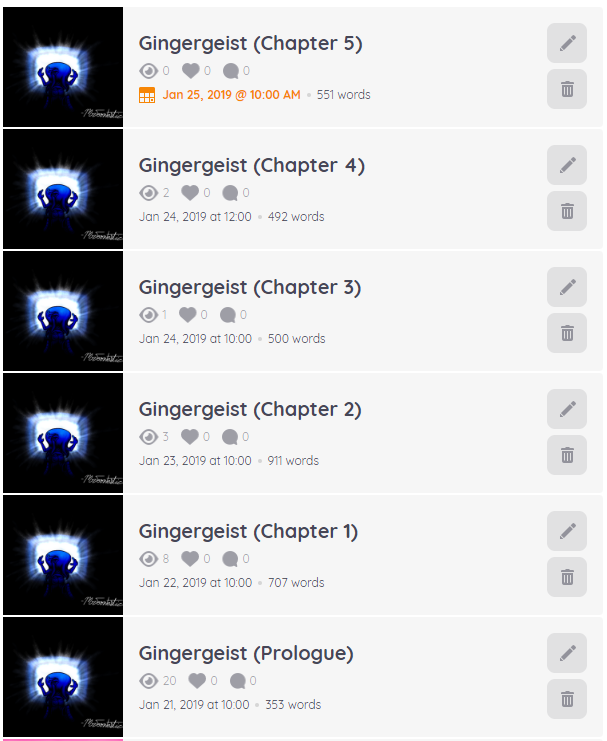 To be fair, I started posting with a buffer of about this size already built up, so I've just been putting in the work necessary to maintain it and edit existing writing. I would actually like to be quite a bit further ahead. I'm pretty meticulous about foreshadowing (I often do sentence-level edits to set up for events several story arcs in advance) so having a long buffer is really important to me. Plus I'm petrified of letting the quality of my work significantly degrade, letting my schedule slip, or resorting to poor plotting in order to meet a deadline. Honestly, I probably would be paranoid and feel behind even if the entire novel was already written, because that's just how I am. 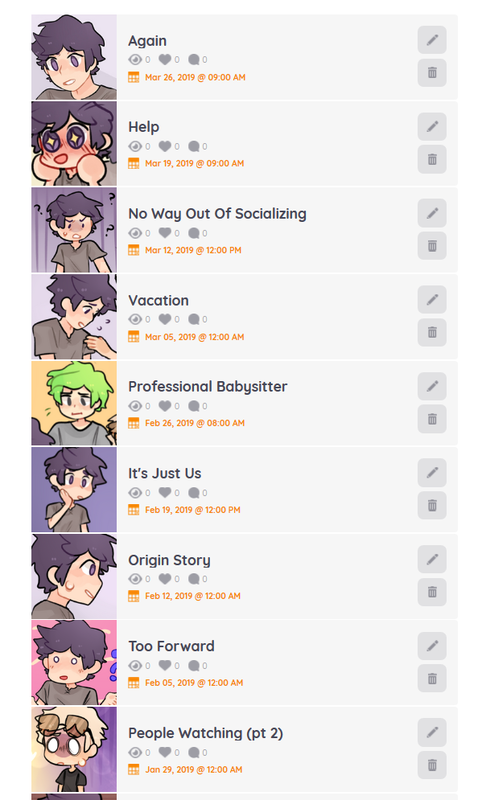 For my main comic, I used to have a pretty consistent two-week buffer, but then a camping trip absolutely destroyed it, and now my buffer is... nothing! Draw the strip every week and post same week. For project two, about four weeks right now, which is nice, but I'd like more personally before I officially start it. Big project is gonna be looking at maybe twenty updates by the time it starts, which is very very nice, but I'm getting antsy and wanna start now, but oh well. 3 months, which is very alarming as I was hoping to build a buffer to make me go until october as I can't draw during the farming season. I still have one month left to draw, but 24 pages in one month is unlikely to happen.